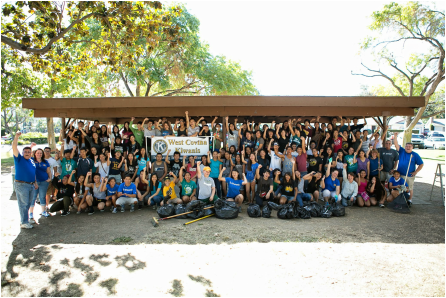 The Kiwanis Club of West Covina began serving the community in January of 1959. As a service based organization, we are committed to supporting children and adults throughout our community and world wide. The West Covina Kiwanis Club is made of community volunteers who support a variety of local projects within the city and surrounding area such as: the Adopt-A-Park Project at Cameron Park for the City of West Covina, host monthly social events at the West Covina Health Care Senior Home, and we volunteer for the Salvation Army, Children’s Hospital of Los Angeles and the Covina Field of Valor and with The Friends of the West Covnia K9s. We provide Christmas baskets to local families, feed the homeless at the L.A. Mission, ship hundreds of “Care Boxes” to our military overseas and we collect over 4000 canned food items for Del Haven Community Center to name just a few. We believe in our community and by working together, we can achieve more. Children are our first priority and we sponsor the Key Clubs at West Covina, Baldwin Park and Sierra Vista High Schools as well as a Builder’s Club at San Jose Charter Academy providing guidance, leadership training and financial support for these students. Our one big fundraising event each year is the West Covina Golf Classic that we hold at South Hills Country Club each July to provide funds for scholarships, service projects and charitable donations. If you give a child a chance to learn, experience, and dream; success will happen. As Kiwanians we see it every day.